For all of the hard-core Chevy engine fans out there, this is for you. 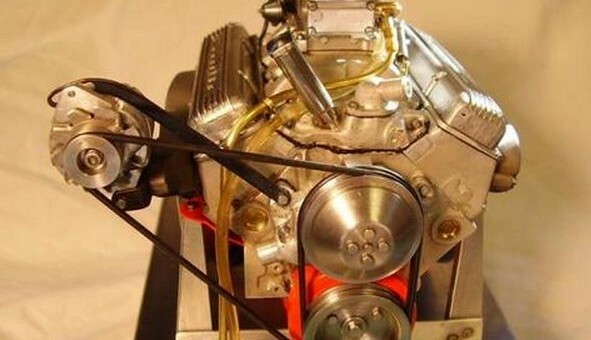 What you’re seeing in the video is a fully operational 1/6 scale replica of a Chevy 327 V8 motor built by Jim Moyer, based on the 365 hp motor found in the 1964 Corvette. The head and engine block are composed of aluminum, which had to be machined on a Bridgeport-style mill. Even the crankshaft has real babbit bearings. Even the firing order of the cylinders mirrors what we would see in a full-scale authentic model. As the little engine fires up, it gives off the sound equivalent of a grass trimmer, rather than a throaty V8, but no matter — the thing works. Currently, Moyer looks to supplement the engine with scale models of a fully functioning water pump and radiator. i love seeing these types of models…it makes me wonder though. if you have the skill to build one of these form scratch, just think of the awesome REAL cars and engines he could have built if he went full scale. if i had half that raw engineering and machining skill, i’d be building my own personal, original, one off dream cars! I’ve thought of it and even tried to assemble ultra-crude sketches of an I4 engine. Personally, I wanted my own small block, but I thought it would be best to start small and easy and then work upwards to the more complex engines. But with an I4, such an engine would have gone into a suitable mosquito-weight car giving it exceptional power to weight and handling…..or so I thought. I think it was when I realized that I would have to have an intimate knowledge of materal physics, as well as physics generally that made me say ‘Screw it, I’ll just buy the crates and parts and pay some guy to tig weld me a frame’. Ever notice that Ducatti, and Moto Guzi motorcycles with 90 twins, go; wwwaaaaaaaaaah too. I would imagine the crank is a single plane – especially by the lack of pulse in the exhaust note. Making a dual plane crank that small would be pretty difficult, but not impossible. Owch, I see your point Brian, in a production run of one I doubt there are castings or forging involved. You can program a CNC machining center to widdle out annything you want with endmills and the like, but to achive workable precision for the bearing surfaces even a single plane crankshaft would require multiple milling turning and grinding operations, a two plane that small would cost as much as a full scale engine. You could do a two plane the way Lindburg or Monogram did with the Visable V8 model kit and stack modular elements to form 90 degree crankshaft throws, this seems like it would be weak under operational loads, but the scale might provide sufficient robustness. anyhow the model sounds like a single plane crankshaft. Did they make that replica in a 2-stroke? It sure sounds like one.